High temperature solid state method was employed to prepare target product in this study. First, LiNi0.5Co0.2Mn0.3O2 Materials were mixed with nano-Al2O3 in a certain ratio, then the mixture was calcinated at high temperature. After cooled to room temperature, the product was mechanical crushed to pass through a sieve, and Li(Mn, Co, Ni)O2 coated with nano-Al2O3 was obtained. When the target product was synthesized at 750˚C for 10 h and the nano-Al2O3 addition was 0.3%, its comprehensive performance is relatively better, and the initial capacity and capacity retention after 50 cycles are 156.3 mAh/g and 99.03% respectively. 孙玉城. 镍钴锰酸锂三元正极材料的研究与应用[J]. 无机盐工业, 2014, 46(1): 1-3. 陈鹏, 肖冠, 廖世军. 具有不同组成的镍钴锰三元材料的最新研究进展[J]. 化工进展, 2016, 35(1): 166-174. 张正国, 马小华, 雒春辉, 朱亮, 王芳, 龚波林. 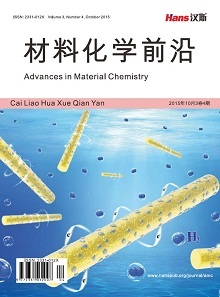 Al2O3包覆对三元正极材料结构和性能的影响[J]. 中国陶瓷, 2015, 51(8): 19-22. 杨勤峰, 高虹. 锂离子电池正极材料钴酸锂的氧化铝包覆研究[J]. 有色矿冶, 2006, 22(4): 37-39. 俞会根, 王恒, 盛军. 三元正极材料Li[Ni-Co-Mn]O2的研究进展[J]. 电源技术, 2014, 21(9): 1749-1752. 蔡少伟. 锂离子电池正极三元材料的研究进展及应用[J]. 电源技术, 2013, 20(6): 1065-1068.